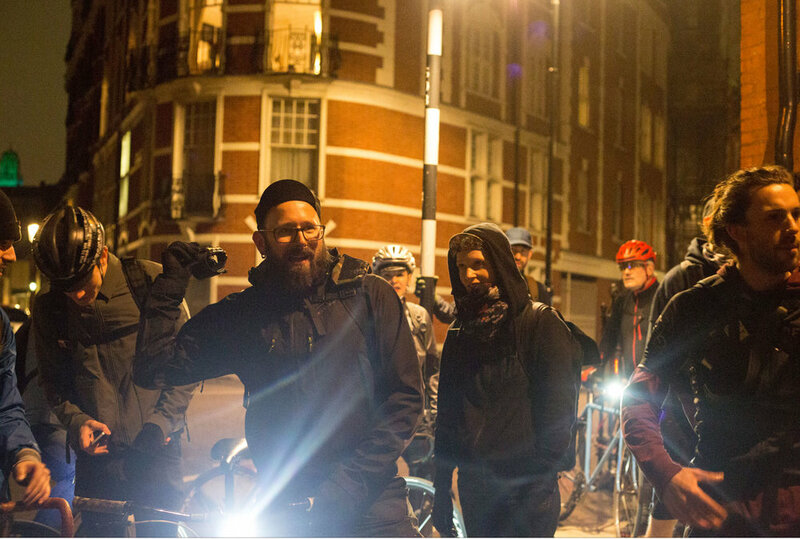 Ride LXV which turned out to be a rad but chilly cruise around West London. Lead once again by our very own street boss, Fraser. To keep us lubricated we had a little stop at the Peace Pagoda in Battersea and guzzled a few free bottles of Jarr, from our new team sponsor Jarr Kombucha. Supremely hydrated we turned left to cross Battersea bridge and cruised down the Kings Road to Sloane Square for a few laps. Shortly afterwards we had the only bad luck of the evening with Fraser suffering a broken crank arm and not just any crank arm, a bloody Omnium. These are meant to be the stiffest strongest cranks in the industry. With only one pedal in operation Fraser quickly picked himself up and continued the ride taking us for a spin around Belgrave Square Gardens and on to Victoria. Here we regrouped, picked up a few lost friends and called it a night. With the south crew heading to The Gowlett for a post ride beer this was a ride to remember.